What is Steam Guard and how does it help me? How do I enable Steam Guard via email? How do I enable Steam Guard via my smartphone? Is there a limit to the number of machines that can be authorized? How do I get a new Steam Guard code? Why am I being asked to authenticate a "new device" every time I log in on the same device? What if I can't log in once Steam Guard is enabled? Will Steam Guard prohibit me from logging into 3rd party sites that sign in through Steam? How do Steam Guarded accounts get stolen? Why does Steam report 'Steam Guard not enabled' while the Steam Guard button is missing? When Steam Guard is enabled on your account, when you login to your Steam account from an unrecognized device you'll need to provide a special access code to verify it's your account. Depending on your Steam Guard settings, you'll either receive an email with the special code or you'll get it from the Steam Mobile app on your smartphone. Be sure your contact email address is verified with Steam. You must verify your contact email address with Steam. You can check whether your email address is already verified by visiting Steam Account Settings. A verified address will be marked as "Verified." Learn how to verify your email address. Enable Steam Guard in Steam Settings. While logged into the Steam client, you can enable Steam Guard by clicking on "Steam" in the top left hand corner of the client. 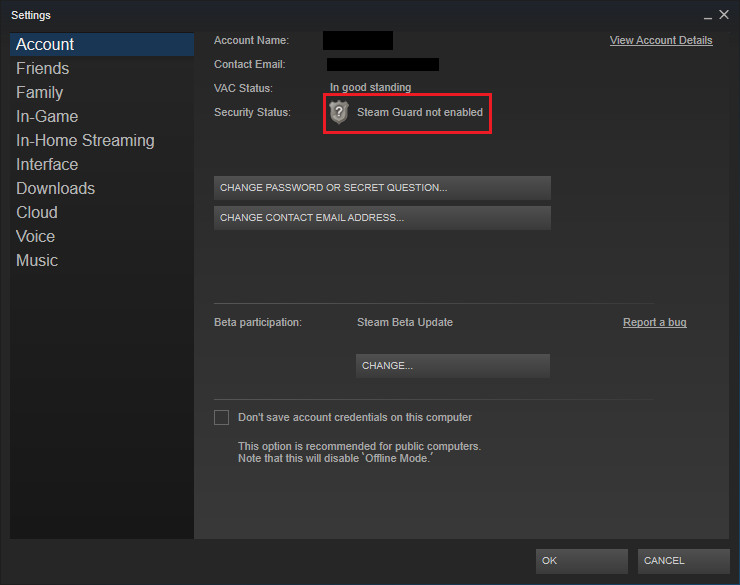 Then go to "Settings" and click "Manage Steam Guard Account Security" under the Account tab. That's it! With Steam Guard enabled, you will be asked to enter the special access code sent to your email address each time you login to Steam from an unrecognized device. Getting Steam Guard codes via your smartphone provides the best level of Steam account security because you're authorizing your logins with a physical device that you possess. You'll need to download and install the free Steam Mobile app to your phone. No, there's no limit. Steam Guard is aimed to protect the value that is yours, not limit your access to your stuff. As always, you can access your Steam account and library from as many machines as you'd like. If you've mistakenly checked the "remember me" box when logging in to a public computer or if your account has been compromised, you should deauthorize any computers that you've previously Steam Guarded. You can do this from your Account Details page > Manage Steam Guard and select "Deauthorize all other devices" at the bottom of the page. This will deauthorize all computers or devices other than the one you're performing this action from. Via email - Exit Steam and log back into your account. This will generate a new verification email. Via phone - The Mobile Authenticator will automatically generate a new code every 30 seconds. Always ensure that you enter the most recent code sent or generated - older codes will not work! Make sure that you are watching the inbox for the email address associated with your Steam account. Perhaps you used a different email address? If you are not receiving the e-mail at all, check your spam filters and spam inbox. Please try adding "support@steampowered.com" and "noreply@steampowered.com" to your contacts or trusted senders list within your email client and request a new access code. Even though Steam instantly sends an email, you may encounter a delay with some email providers depending on their server load and processing times. Please contact us if you have not received the verification email after 3 hours. This may be caused your browser's security settings. If your web browser's ‘Privacy’ settings are set too high, then your browser will be unable to store (web) cookie information. Check your browser settings to ensure that cookies are allowed. Running programs that clear internet history, delete other unused files, block cookie creation or that clean up orphaned registry entries may also be responsible for this issue. Disabling such programs will prevent this issue from occurring when logging into Steam via your web browser. No, Steam Guard will not limit your ability to access your Steam account through partner sites that enable a sign in via your Steam account credentials. Through Email: If your verified email account is stolen or compromised, a user can enter your account freely provided they know your account name. Knowing your Steam account password would not be required as this can be reset with access to your email account. Never use the same password for both your email and Steam account. Acquiring a Steam Guard File: Steam will never ask you to provide any Steam Guard files. If you upload or give a user your Steam Guard .SSFN file, they can gain access to your account without accessing your email account. However, they must know your Steam account password and username to use this file. Malware: Hijackers can use malware to gain access to your computer and login to your account using your already authorized device. Since your Steam account could be open or you have your account credentials saved, the hijacker does not need to know anything about your account to gain access. Using a proper anti-virus software with real time protection and avoiding unsafe websites/files will prevent malware from entering your system. This can happen after Steam Support has restored your account. If the button to enable or change Steam Guard's settings is missing you must restart Steam. Why do I have to enter a Steam Guard code every time I log in?